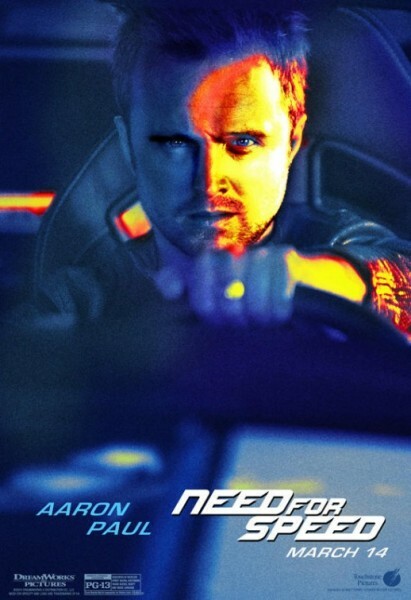 Is “Need for Speed” Aaron Paul’s Big Break? When last we saw Aaron Paul on Breaking Bad‘s peerless series finale, he was behind the wheel of a car heading for… who knows where? Well, now we know: Based on his cinematic starring debut in the videogame adaptation Need for Speed, Paul’s on the road to nowhere. Not since Mark Hamill immediately skidded from Star Wars to 1978’s clunker Corvette Summer has an actor crashed so quickly with a followup vehicle. Paul attempts to invest deeply felt emotion into the story of a street racer who is unjustly convicted of a crime and swears revenge on the rival driver (Dominic Cooper, one of my least favorite actors) who set him up. But without Vince Gilligan’s genius words to speak, Paul somehow seems smaller, even on a big screen. He’s not the only good actor trapped in Need for Speed‘s wreckage: Michael Keaton, who should’ve learned his automotive lesson after Herbie: Fully Loaded, phones in his role as the webcasting sponsor of the Big Race that it takes the shockingly slow 130-minute film to reach. Dakota Johnson bides her time before 50 Shades of Grey as Cooper’s girlfriend. And gifted young British actress Imogen Poots (A Late Quartet) proves instantly annoying as Paul’s spunky love interest. Need for Speed wants to be The Fast and the Furious, but its car chases (even in 3D) are stuck in low gear. The movie—which bizarrely starts in the sleepy suburban town of Mt. Kisco, New York, an unlikely locale for street racing—takes Paul’s character on a cross-country journey, somehow eluding authorities along the way. The script, by John Gatins (whose Oscar-nominated screenplay for Flight must’ve been a fluke) and George Gatins, includes references to Speed, Top Gun and Bullitt but the film is nowhere near their caliber. Director Scott Waugh made his debut working with real Navy SEALS in Act of Valor, and elicits equally amateurish performances from his professional cast here. Paul will get a few more shots at movie stardom, and one can only hope his roles in Ridley Scott’s biblical epic Exodus and the Nick Hornby adapation A Long Way Down (opposite Poots again) will lift him back up again. If not… Better Caul Saul! After the first hour, I couldn’t handle anymore sounds of engines being revved-up, cars being smash or tires being streaked across the road. I just wanted it to end. Good review. « Like Fretts on Film? Try Fretts on TV!